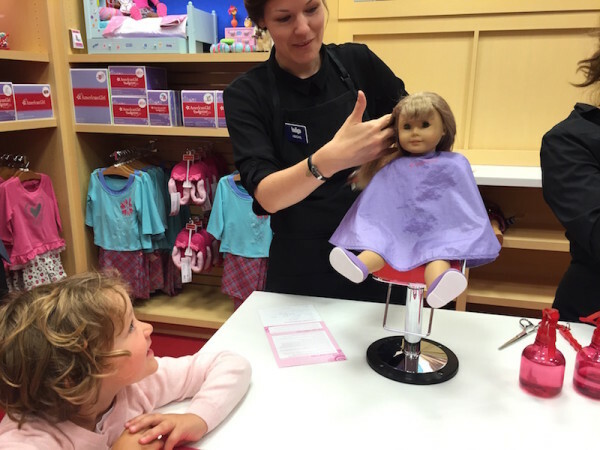 Over the past year, American Girl Specialty Boutiques have been opening up in a number of Indigo Kids stores across Canada. 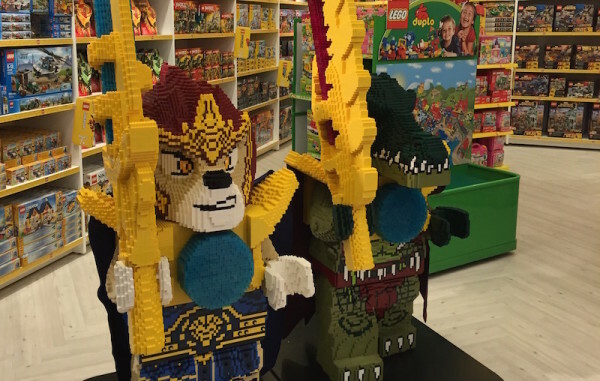 Now a brand new location is open in the heart of downtown Toronto in the Toronto Eaton Centre. Located in Indigo Kids on the 3rd floor of the Eaton Centre, the American Girl specialty boutique is a not to be missed experience while in Toronto. The whole Indigo Kids section of the store has undergone a massive renovation with new sections for Lego, Imaginative Play, Books and more. What I love about the new American Girl Specialty Boutique is that it feels a lot like a separate store. There is a separate entrance to the Boutique and once you pass through the door, it feels like you’ve been transported to one of the larger stores in Chicago or New York. 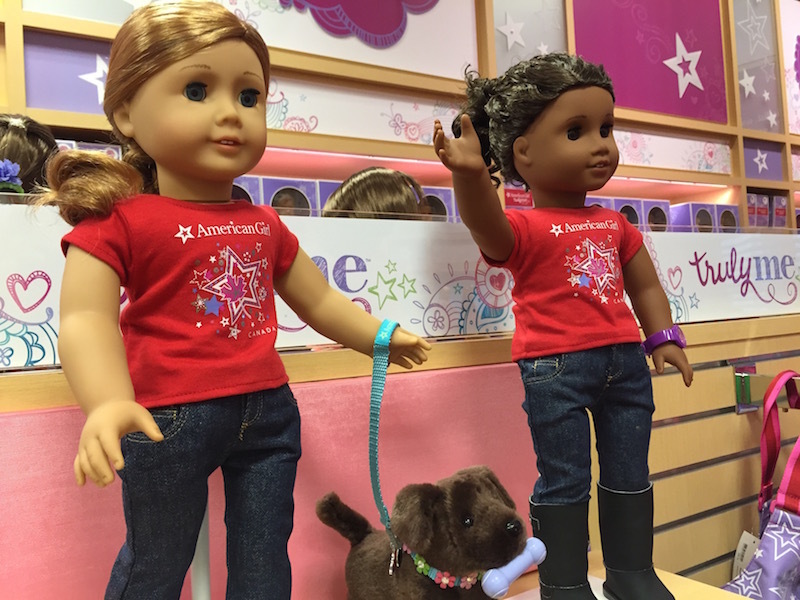 The American Girl Specialty Boutique has enough selection to keep your American Girl fan busy for a long time. The centre of the Boutique is a very cool hair salon where American Girl dolls are treated to braids, ribbons and some very intricate hair designs. Your American Girl doll also has the option of getting her ears pierced. We brought along Ursula, Charlie’s American Girl doll who is over 3 years old now. She left the Boutique looking brand new and with a selection of earrings for her newly pierced ears. 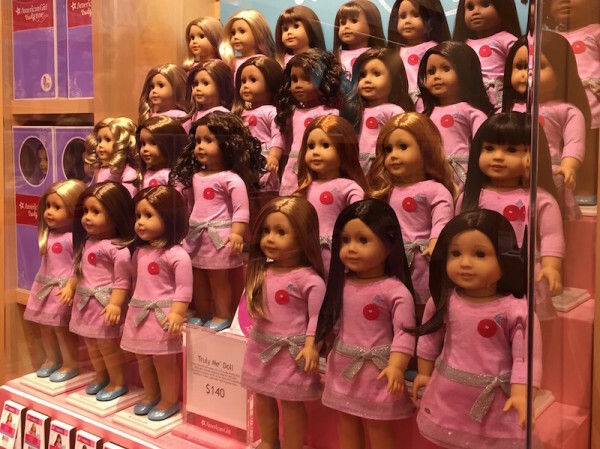 The American Girl in the Toronto Eaton Centre is now open daily. 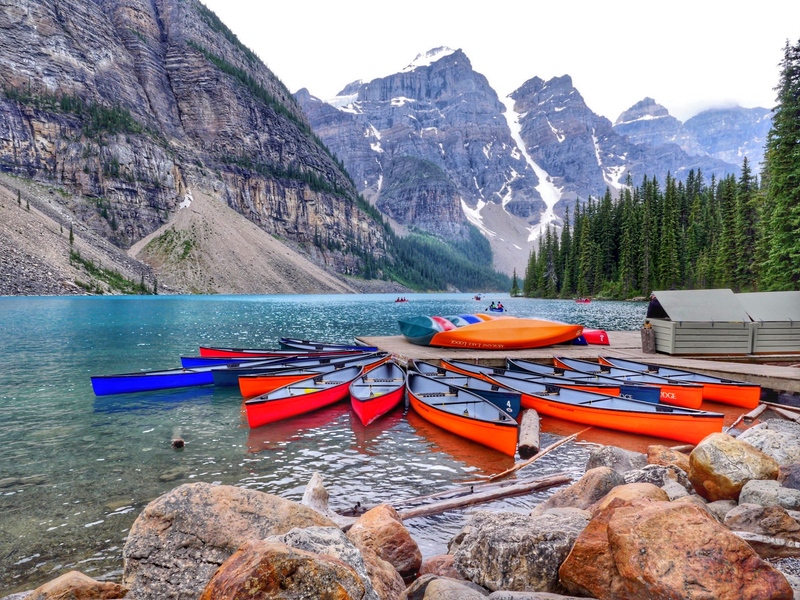 Check holiday schedule before visiting. A coupon for a free Flip Pony Hairstyle for the American Girl Doll. Enter before August 4th 2015 at 11:59 PM! 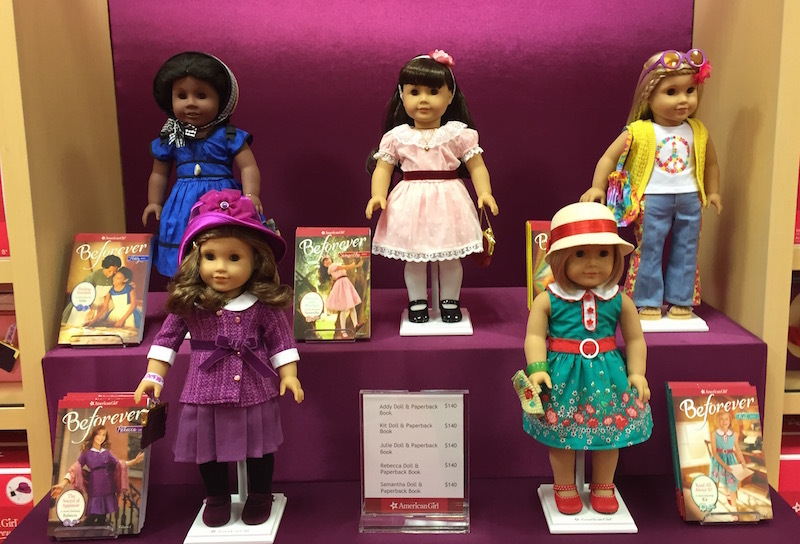 For tips on visiting an American Girl store in the US and to enter an American Girl book giveaway, click here to visit Gone with the Family! Yes, I have! 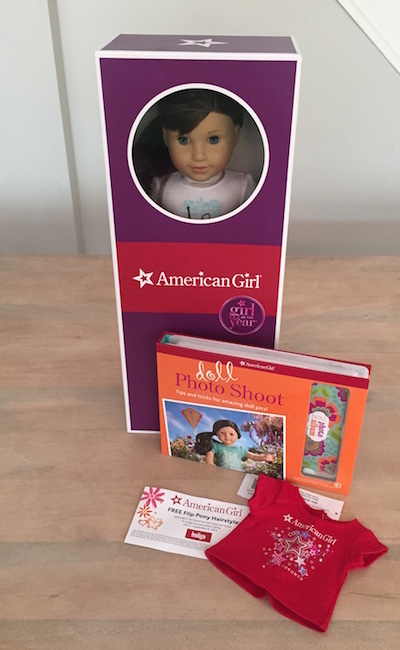 So excited that American Girl has arrived in Canada! Love the AG store in NYC! We have visited the one at Yorkdale a few times…I have to admit I love going as much as my girls do! And having a store within driving distance totally saved my bacon at Christmas. I haven’t yet, but we are going to do it this weekend, I know it’s going to be awesome!! We went to NY to the American Girl. I will definitly go to the obe at Eaton Centre. It’s a good excuse to go shopping over there! My goodness what a wonderful giveaway, that is so sweet and super charitable haha since we all know how these are great quality dolls and can cost a pretty penny! My daughter has an American Girl doll, Marie Grace, and I need to rewig her soon but this girl has got style. I watched the movie with my girl and she’s slightly obsessed now ahha!! I haven’t visited an AG boutique yet, we don’t live close to one. Perhaps someday . . . Yes I have. My daughter loves American Girl. We’ve never been to an AG boutique. My DH bought our girls AG dolls (Isabelle x 2) when he was in St. Louis. My goodness! I will never miss to visit the boutique if I am be in the city. I’ve never been to any of their stores but now that they’re in Toronto, I’ll definitely take my daughter. Maybe even this August when we’re enjoying our annual vacation in the city. I wish I could win because all my friends have grace and other dolls. That’s so cool that you do giveaways!!! Ive never been to the AG place but I might go to the DC store soon!! Has the winner of the giveaway been chosen yet? I know you can’t enter the contest anymore, but did someone win the giveaway or has it not ended yet? Hi! Thanks for asking. The draw results have been posted on the Solo Mom Takes Flight facebook page.